Find bars, pubs and clubs in major Australian cities including Sydney, Melbourne, Brisbane, Perth, Adelaide, Hobart, Canberra, Darwin. 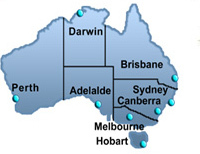 Australia is known for its lively bars, pubs and clubs scene. Whether you are a local, a backpacker on a shoestring budget, or a leisure tourist with deep pockets and a youthful heart, Australian venues have everything for everyone.